Our Team is known for being dedicated to providing the best customer care in our area. It is our intention to provide exceptional service to keep your system in good repair & operating condition. Whether it's a service issue repaired by our skilled and qualified Service Technicians or a conversation with our Office Team, we work hard to make your experience enjoyable. Born in Monroe, WI but has lived in Cape Coral for over 30 years. Adam graduated from Bishop Verot High School in 2002 and is a graduate of Florida Gulf Coast University in 2007. Armed with his Bachelor's Degree in Business Management & his years of A/C experience, he entered the partnership of Schultz Air Conditioning in 2016. Adam is a "working boss" still in the field managing his team to ensure that service and customer care are exceeding expectations. You'll find him spending extra time with our customers, listening to every concern that they might have. When not working Adam enjoys baseball, listening to his vinyl collection, exploring the various microbreweries in town and spending time with wife, Ashley. Keith grew up on a dairy farm in South Wayne, WI. He moved to Cape Coral in 1984 where he began his A/C career shortly thereafter. He founded Schultz Refrigeration & Air Conditioning in 1992. In 2016, after 32 years of turning wrenches, he welcomed his new partner, his eldest son, Adam to form Schultz Air Conditioning. “Pops” is now "on call" for consultations and words of encouragement to the crew. Now spending his days working in the yard, having coffee with friends and on occasion, a brandy and cigar on the back porch with one of the two poodles on his lap. Julia has been a dedicated team leader since the very beginning. She's been a constant source of information and positivity for our team and customers. There are few that know as much as Julia when it comes to customizing the perfect system for your home. She takes the time to ask our customers every question necessary to find that match. If she doesn't know the answer, you can bet she will be spending her afternoon researching and finding out! She loves to quilt and cook when not answering all of your Air Conditioning questions! Born and raised in Fort Myers. (Yep, She's a LOCAL!) Ashley is a graduate of Florida Gulf Coast University with a Bachelor's Degree in Resort & Hospitality Management. She joined the Schultz family officially in 2016 when she married Adam. She left her hospitality career after 7 years and has been an addition to the office team ever since. Ashley's background in event planning and hospitality make her the perfect fit for the office. 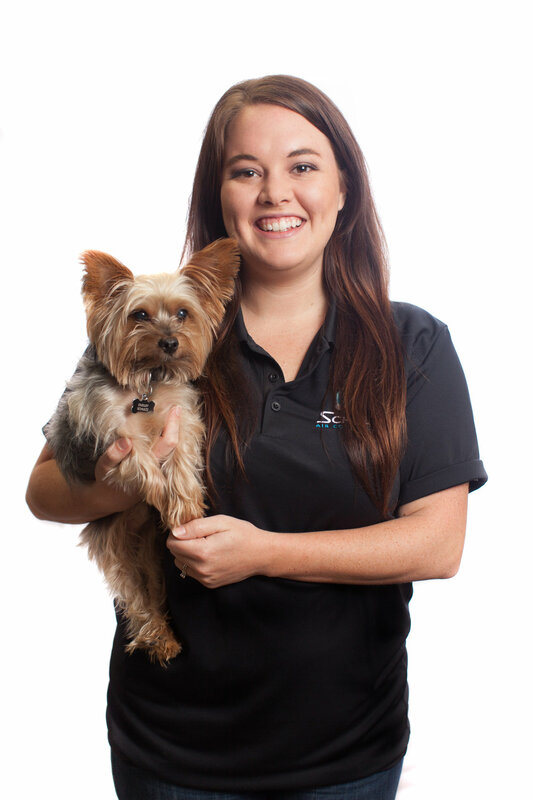 She is responsible for scheduling, permitting and registering new A/C installs. She also assists our Service Techs in making sure that they have all the materials needed. After work, Ashley can't wait to get home to Dudley, her Yorkie. She also enjoys baseball with Adam, cooking and a hot cup of tea. Orginally from Arizona, Mary has been a part of the Schultz family since 1999. She's been the sweet voice on the phone getting to know our customers over the years. She makes your appointments but also takes the time to better understand the type of issues you're having with your system. She then relays that information to our Service Techs who are better prepared when they arrive to make your repair. Mary not only cares for "the boys" at work, but also has a beautiful family of her own. She's a loving Mother to three children and "Nana" to four grandchildren. Born and raised in Cape Coral. He is a graduate of Bishop Verot High School and Florida Southwestern University. Although he moonlights for the family business, his day job is in Management at a local grocery chain. Adam's youngest brother is called in to help with tight duct jobs. He is responsible for installing the air ventilation system in your home. He is proficient in sealing leaks and balancing air flow. Aaron is hardworking and in his off time likes to spend time with his dog, his best bud fishing or cooking at home. Mehdi joined our team in February 2018. He is originally from Morocco but moved to Cape Coral recently to be closer to his family. Mehdi is responsible for assisting our Service Techs on the job site. He is currently working towards his certification as a HVAC technician. He has become proficient in A/C Maintenance. Mehdi enjoys spending time with his wife, surfing and being outdoors. Jay has 40+ years experience in the HVAC industry. He is dedicated to making sure every new Air Conditioning install is perfect and that our customer's stay comfortable. He is our go to guy to for installation of new air conditioning systems and ductwork. Although not technically a Schultz “Uncle Jay” has been a part of the Schultz family for more than 25 years. Drew joined the Schultz team in August 2018. He brings 6 years HVAC experience & extensive knowledge in both Trane and Carrier A/C systems. Ask him just about anything and he’ll know the answer! Drew is our resident animal lover! When not at work, he enjoys spending time with his family and pets!